Once upon a time, you could go to your corner butcher and buy an aged USDA prime cut of beef. If you have had a good, aged steak, you know it is more tender and flavorful than what you typically buy in the store. The reason for this is that aging allows natural enzymes to break down the hard connective tissue in meats and for water to evaporate away, concentrating the flavor. The old method of aging meat is known as dry aging. Dry aging is done by hanging meat in a controlled, closely watched, refrigerated environment. The temperature needs to stay between 36 F and freezing. Too warm and the meat will spoil, too cold and it will freeze, stopping the aging process. You also need a humidity of about 85 percent to reduce water loss. To control bacteria, you need a constant flow of air all around the meat, which means it needs to be hanging in a well-ventilated space. The last and most important ingredient in this process is an experienced butcher to keep a close eye on the aging meat. There are many reasons that butchers don't typically age meat these days. Firs, the cost of aged beef can be very high. Because of the weight loss of aged beef, the price per pound can be pretty outrageous. If you add in the time, storage space, refrigeration, labor that price just keeps moving up. 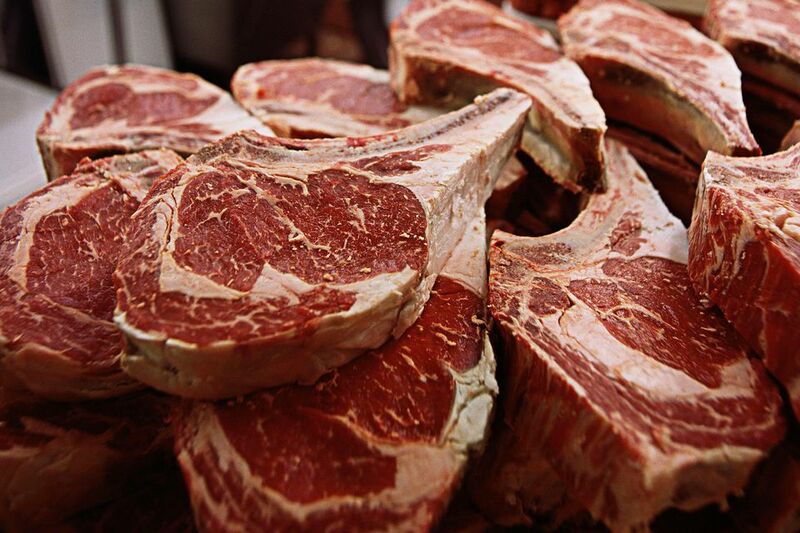 For meat aging to properly improve the quality of a cut, it should contain substantial marbling. This means that there is fat evenly distributed throughout the meat. Only the highest grades have this kind of marbling and make aging worthwhile. Because of the high price and the space necessary to age meat, dry aging has become very rare. Actually, only a few of the finest restaurants buy aged beef. Many, in fact, have taken to aging their own beef. This can be a risky job if you don't know what you are doing and you need a good sense of smell. If your aged meat doesn't smell right, throw it out. Aging takes about 11 days before you see much improvement in the flavor of the meat. After that, the flavor continues to intensify, but so does the loss of weight and the risk of spoilage. Eventually, the meat will be worthless so many fine restaurants who do their own aging will limit it to 20 to 30 days. The less expensive alternative to dry aging is called wet aging. Meat is shipped from packing plants to butchers in vacuum packaging. Butchers can set this packed meat aside in their refrigerators and allow them to age. Since the meat is packed in its own juices the enzymes will break down the connective tissues and make it more tender. However, because there will be no fluid loss, the concentration of flavor that you get from dry aging won’t happen. You may be tempted to age beef at home. You could take a vacuum packed primal cut (from which market cuts are taken) from the butcher and put it in the refrigerator for two weeks in hopes of producing a really tender piece of meat. However, aging needs to be done at precise temperatures and humidity under controlled circumstances. The average family refrigerator just doesn’t have what it takes to properly age beef. It is very easy to get a good colony of bacteria going in that meat during the couple of weeks it takes to age a piece of beef. There is a technique circulating online that is really a recipe for a trip to the hospital. Take your prime or choice steaks, unwrap them, rinse with cold water, wrap in a clean kitchen towel, and place on the coldest shelf of your refrigerator. Every day for two weeks, take the steaks out and change the towel. At this point, you are promised a fantastic steak, provided you live through the digestive process after eating it. What you need is the experience and knowledge to know when spoilage first starts. There is a definite change in smell and color of the meat so very close inspection is required during the aging process to ensure that it doesn't go bad. The biggest risks to any piece of meat that you buy from the store and attempt to age are all the things that happened to that meat before you picked it up. Any exposure to bacteria during butchering, packing or shipping can make that meat unsafe to age. It is popular with many of the competition barbecue cooks to age their briskets. This is done for a short period of time and with sealed meats. The cryovac briskets can be held in your refrigerator for a week or two safely. It is debatable how much improvement you get out of this limited process.